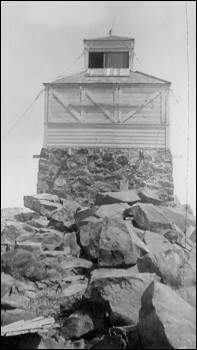 This is the old fire lookout on Mount McLoughlin. This photo was taken by my mother, Fredene Daugherty, on August 14, 1936. She was 14 years old. She had climbed to the summit with her group of Girl Scouts from their camp at Lake of the Woods. She was at camp August 9-23. The lookout has long disappeared. All that's left are a few scattered stones from the foundation.